Heat the oven broiler on high. First, make the crostini. Lay the baguette slices in a single layer on a bake sheet. Brush both sides of each with the 1 tablespoon olive oil. Toast the bread right under the broiler, watching constantly, until golden on the top side around the edges. Flip each piece over, and brown the other sides. Remove crostini from the oven. Take a clove of garlic and slice in half. Rub the top side of each crostini with the cut face of the garlic clove. Set the crostini aside, but reserve the garlic clove. Add to the remaining garlic clove and mince both. 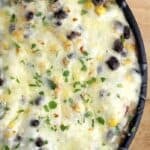 In a medium mixing bowl, add the minced garlic from the step above with the black beans, corn, poblano pepper, salsa, lime zest, lime juice, salt, pepper, 1 tablespoon oregano, and the remaining 2 teaspoons olive oil. To cheese up the bruschetta, stir 1/4 cup queso fresco cheese into the bruschetta. Layer onto a thin pan (I used a flat cast iron skillet). Top with all of the Monterey Jack cheese, as well as the remaining 1/4 cup queso fresco. Place pan under the broiler for a minute of two until cheese is melty, creamy, and bubbly, but not browned. Remove from the oven, top with a sprinkle of fresh oregano and serve immediately with the crostini. Yields 6 servings. At the point where most of the ingredients are combined (i.e. before cheese is yet added), this by itself is a delicious bruschetta. I ate a bunch at that point.